It started with a police officer shooting a young black man. Not much else offered, not much else known. It happened in Ferguson, Missouri, a suburb of St. Louis. This was probably what got me to notice first, as one of my seminary field placements was in nearby Florissant. Both of these communities house large African-American populations, and I experienced a small taste of the racial tension that exists in those areas while serving there. Before too long, news of this shooting gave way to something else. I watched as people shared firsthand accounts of something larger on Twitter. On the one hand, people began organizing protests, raising questions about what happened leading up to Michael Brown's death, expressing anger that the killing of a young unarmed black male had happened yet again. On the other, there were accounts of the police department's response: silence, followed by heavily armored and armed officers intimidating, arresting, and firing tear gas and rubber bullets into the crowds. Reporters were told to stop recording; some were arrested. Live-tweeters noted the absence of badges and other identifiers on uniforms. Some officers have been caught calling the protesters "animals." Little regard has been shown for people's rights or humanity. This was worse. Much worse. And it has worsened still. What do we now know, so many days after that first event that claimed a young man's life? We know that the intimidation of crowds hasn't stopped. We know that outside instigators are likely responsible for some of the more egregious instances of looting, vandalism, and other violence while residents protected businesses. We know that the National Guard has moved in, which hasn't worked very well when it has happened in the past in places like Kent State. But we also know that people are angry. Residents of Ferguson are angry. 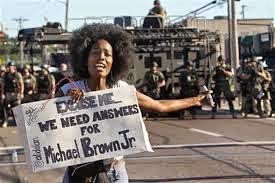 They are angry because they want to know why Michael Brown was shot six times and why the officer who killed him, Darren Wilson, has seemingly disappeared rather than be brought to justice. They are angry because their community has been overtaken not only by the people meant to serve and protect them, but by outsiders seeking an opportunity. They are also angry because this happened again. Just like Trayvon Martin. Just like Jordan Davis. Just like Renisha McBride. Just like Eric Garner. All unarmed people, suspected, feared, pursued, or threatened due to their skin color. As a white male, one of the options available to me is that I can try to ignore these cases. From my place of privilege, maybe I could express offense at how uncouth the protesters are acting, or clutch my pearls at the news that Brown might have been high at the time of his death, or try to justify his being shot a half dozen times because he might have stolen some cigars. Or I could listen. Not take in a few token soundbites from protesters, not encourage residents to calm down and be nice first. I mean listen and really hear, and brace myself for how uncomfortable I in my position will be made to feel. I could really listen to a story that spans back decades and centuries and across states and continents of a people who have never truly experienced safety, freedom, and opportunity in the same way that I have. I could really listen to a story that includes righteous anger and broken trust. And I would have to realize beforehand that it's not my story and it's not my place to try to take it away from the storyteller, or at least try to get them to soften the edges to make me feel better. Can you see the suffering Christ in the oppressed, even the ones who aren’t responding perfectly to society’s oppression? Christ doesn’t just suffer for the innocent, the ones who don’t have the energy to fight back, or the ones who perfectly respond to injustice. He suffers for the ones who suffer now and sin in their suffering. And make no mistake, our God is a God of justice. The young black men who launch Molotov cocktails at the police are misappropriating God’s justice by taking it into their own hands, but the rage they feel is the rage that God feels towards injustice. In a sense, they are imaging forth God’s justice to an unjust world. Seeing the suffering Christ in these young men isn’t achieved by theological gymnastics, deep pity, or altruism. It’s done by listening to their stories, sharing life, standing in solidarity with them, and experiencing their rage. I’ve written elsewhere that when oppressed people are angry, privileged people should listen up. Can you learn from the violent protesters as well as the peaceful protesters? Can you see the Imago Dei in both? "When oppressed people are angry, privileged people should listen up." Not search for the easy out. Not throw it back on the angry person to act more respectable. Not seek justification, however flimsy, for the death of an unarmed black teen in order to stop having to care. Not try to place our discomfort or prejudices above their story. Listen up. And listen hard. That's where it has to start.